Return Flights to Amman on Fly Dubai. 01 Night stay in Dead Sea with breakfast at Holiday Inn Resort or similar. 01 Night stay in Wadi Rum Desert at Hasan Zawaidah Camp or similar with dinner & breakfast. 01 Night stay in Amman with breakfast at The Sanrock By LeReve Hotels or similar. Entry visa to Jordan for non-restricted nationality. Jordan, an Arab nation on the east bank of the Jordan River, is defined by ancient monuments, nature reserves and seaside resorts. 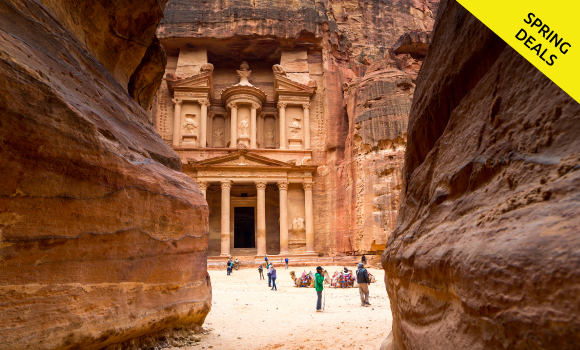 It’s home to the famed archaeological site of Petra, the Nabatean capital dating to around 300 B.C. Amman, the capital of Jordan, is a modern city with numerous ancient ruins. Atop Jabal al-Qala’a hill, the historic Citadel includes the pillars of the Roman Temple of Hercules and the 8th-century Umayyad Palace complex, known for its grand dome. All kind of tips (Guide, Driver, Horse Boy In Petra, Wadi Rum Jeeps, Local Guides … etc). •	You will be transferred to the hotel in Dead Sea. •	Enjoy the sunshine at the lowest point on earth. •	Spend the day floating and relaxing in Dead Sea. •	Overnight stay at the chosen hotel. •	After breakfast, head to Petra - The Red Rose City. •	Walk through the canyon and be astounded at the magnificent Treasury, the entrance guarding the ancient Nabatians city, now one of the Modern 7 Wonders of the World. 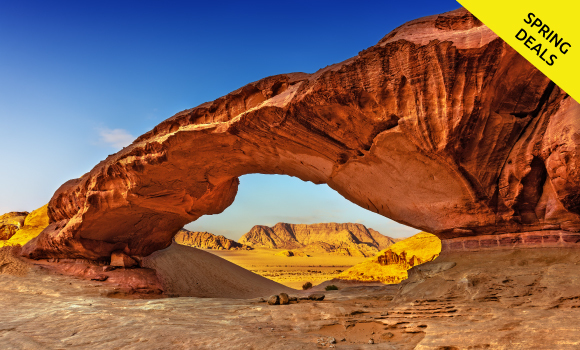 •	Enjoy the wilderness adventure of a 4×4 jeep tour of Wadi Rum, following in the footsteps of Lawrence of Arabia, climbing sand dunes and rock bridges. •	Dinner and overnight stay at a camp in Wadi Rum. Wadi Rum - Mt. Nebo & Madaba. •	Buffet breakfast at the camp. •	Drive to Mt. Nebo, from where Moses viewed the Promised Land. •	Drive to to Madaba and visit the St. George Church is known for its famous mosaic map. •	Check-in and overnight stay at the chosen hotel in Amman. Amman city tour & Departure. •	Afternoon check out from the hotel and proceed for Amman city tour. •	See places like Citadel, Archaeological Museum, Roman Theatre etc. •	Spare some time for shopping exclusive items from Souqe in down Town. •	In due time get transfer to Amman International Airport.